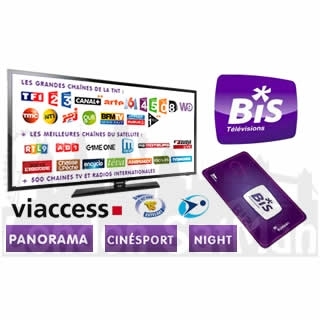 London SatMan now stocks French satellite TV provider Bis TV viewing cards. Bis TV Panorama viewing card can be upgraded at the time of purchase with movie channels (Cinesport) and adult channels (Night). Please check other listing for Cinerama and Ultimum. Viaccess CAM and/or HD digital satellite receivers are also available at discounted price if purchased together with the card.